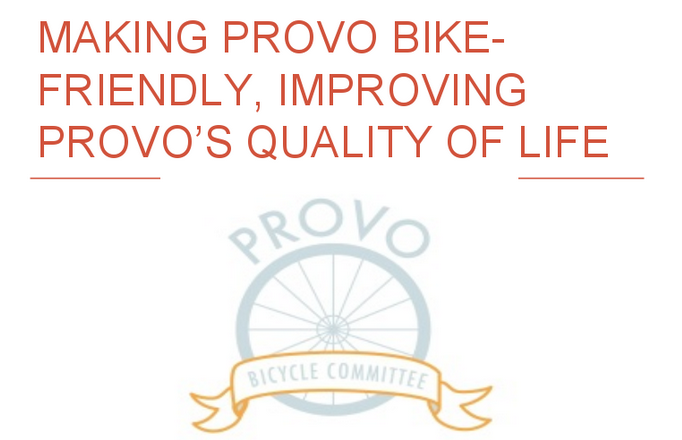 On January 19, the Provo Bicycle Committee presented to the city council during its work session. – We thanked the council and administration for their support to make Provo more bicycle friendly. – We offered to periodically have the committee report to the council and/or to TMAC. – We emphasized that our efforts to make Provo bicycle friendly are fundamentally about improving the Provo’s quality of life. – We noted the specific quality of life benefits of being bicycle friendly: reducing air pollution; reducing congestion and parking pressures; calming traffic; boosting economic vibrancy and making it easier for employers to recruit and retain highly educated, tech savvy employees, especially millennials, by providing residents with transportation options; and encouraging active lifestyles that improve the health and happiness of the community. – We provided an overview of the accomplishments of the bicycle community last year, and encouraged Provo to send a delegation to Fort Collins, a platinum-level bicycle-friendly city that Provo could learn a lot from not just in terms of bicycling, but also in terms of parking, transit (BRT), and other quality of life issues. – We also encouraged the city to support more tactical urbanist events like the one held in the Joaquin Neighborhood last June. – Finally, we urged the council to do three specific things to more aggressively implement the Bicycle Master Plan and improve Provo’s quality of life. 1. Adopt complete streets as an official policy in the form of a intent statement. For the last five years, the Provo Bicycle Committee has recognized a dedicated bicycle commuter with Golden Spoke Award at the annual Mayor’s Bike to Work Day in May. Starting last year, to remind folks that we can commute to work and school by bicycle all year round, even in the dead of winter, the Committee inaugurated the Golden Spoke Winter Bicycle Commuter Award, and Canyon Bicycles has kindly acted as the sponsor for the winter award. Last year, the committee recognized Lexi Williamson, a BYU student who lives on the west side and commutes to campus year round by bicycle. This year, we would again like to recognize another west-sider. To introduce his story take a look at this short clip from KSL news that was broadcast last April. In the report, Stan says “I have fallen in love with bike riding. I ride a lot—good weather, bad weather.” You may have also noticed him wearing Adobe bike shorts. “When he made the goal to lose 100 pounds, he was already in the habit of using Frontrunner to get to work at Adobe, but he started riding his bike to get to the Orem train station and then from the Lehi station up the hill to the Adobe building. At first he biked two or three times a week but before long it was every day. He didn’t commute that first winter but he has ever since. He’s pretty stubborn about riding regardless of the weather. Becky continued by writing, “Adobe pays for their employee’s Frontrunner passes. 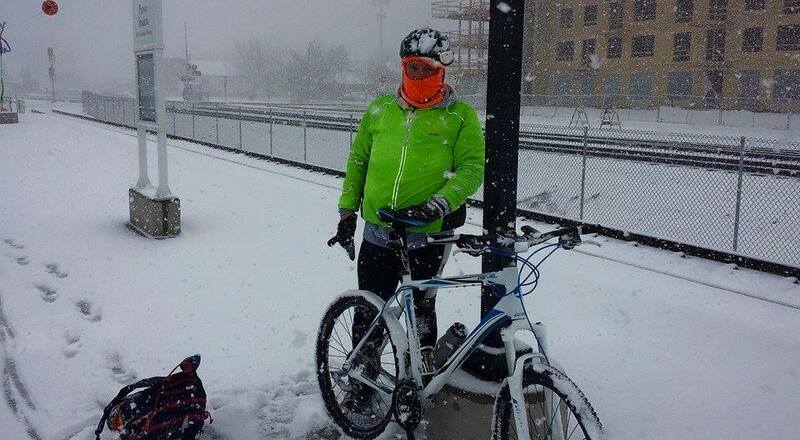 This made all the difference in his decision to ride his bike to work. Otherwise, it would have been rather expensive, and it’s hard to say if he would’ve developed the habit of using Frontunner. Adobe’s commuter check program–the biking incentive program–pays him $20 per month which is very nice. Stan says he would commute anyway, even without that incentive, because he likes it. I think though, that this commuter check program has had an indirect effect as well: Adobe has a cycling community and that it makes a difference when you have buddies at work that you share bike riding stories with. In conclusion, Becky wrote, “It is probably not exaggerating to say that bicycle commuting has saved Stan’s life. Losing weight has increased the quality of his life immeasurably. The key to his successful weight loss has been consistency, and that consistency has been facilitated by combining his exercise with his commute to work. He’s in the best shape of his adult life. He loves to get out in the fresh air every single day”—even in the dead of winter. Congratulations to Stan Paulson, the recipient of the 2016 Canyon Bicycles’ Golden Spoke Winter Commuter Award! I hope Provo residents will emulate Stan, and employers—including Provo City—will emulate Adobe by offering their employees incentives to use active transportation and improve their health and lives. It is a pleasure to present this award to Stan today, which happens to his and Becky’s 25th wedding anniversary. Congratulations! Check out more about Stan from the Adobe blog.